We ask that whenever possible you try to come to the surgery. This is mainly because we have much better facilities for examining and treatment you at the surgery – but also because it is a more efficient use of our already-stretched time. Sometimes home visits will be required however, for example for patients who are too ill or incapable of travelling to the surgery and who live within the Practice area. We strongly urge that, wherever possible, home visits be requested before 10.30am. We are unable to offer home visits to patients who live outwith the area. Order online, or choose from a range of options. 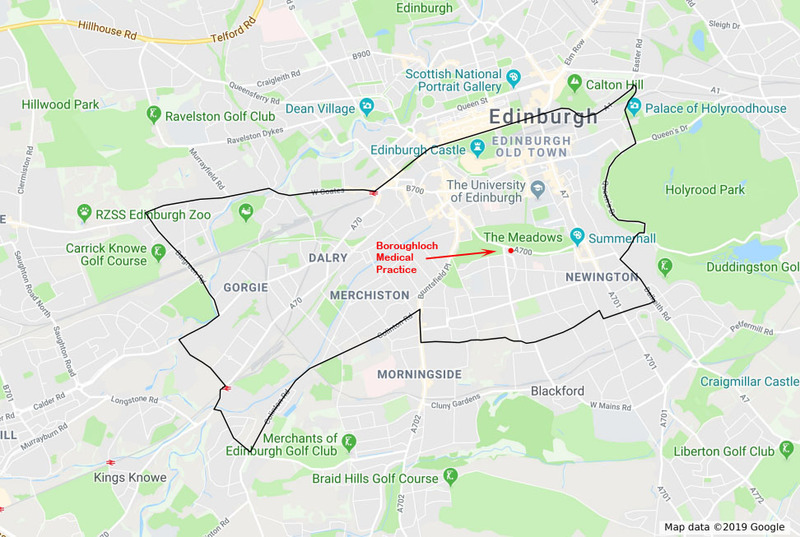 In words, the boundaries of Boroughloch Medical Practice are described as follows: To the North and East Princes St along Waterloo Place and Regent Rd, Montrose Terrace, London Rd to Meadowbank, along the North Queen’s Dr, Holyrood Park Rd, Dalkeith Rd to East Mayfield, West Mayfield, Grange Loan, Newbattle Terrace, Morningside Rd, Colinton Rd, Craiglockhart Ave, Slateford Rd, Chesser Ave, Gorgie Rd, Balgreen Rd and along Corstorphine Rd to join up with Princes St. The information you have provided will be used by Boroughloch Medical Practice to carry out its various functions and services including scheduling appointments, ordering tests, hospital referrals and sending correspondence. Your information, including your name, gender, date of birth and address, will be passed to NHS National Services Scotland where it will be held on the Community Health Index (CHI). This information is used to register you with Boroughloch Medical Practice, transfer your medical records between GP practices in the UK, make payments to GP Practices for medical services provided, and to process and issue medical cards, medical exemption certificates and entitlement cards. NHS National Services Scotland shares information about you within NHSScotland to assist in the provision and improvement of NHS services and the health of the public. When we do this, we make sure that the information which identifies you as a person and your health information are separated or anonymised. Health condition and treatment information which could identify you will not be used for research purposes by the NHS unless you have consented to this. For more information on how NHS National Services Scotland uses your personal information visit www.nhsnss.org. If you have any queries or concerns about how your personal information is used by the NHS please ask for the leaflet ‘Confidentiality – it’s your right’, visit the NHS Inform website at www.nhsinform.co.uk/rights/ or ask your GP surgery. NHS National Services Scotland is the common name of the Common Services Agency for the Scottish Health Service.